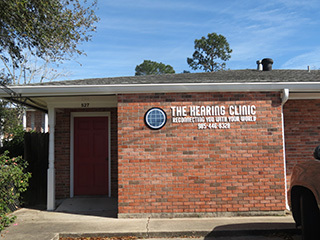 The Hearing Clinic is located at 527 Foret St. in Thibodaux, Louisiana in a four-office building complex at the corner of East 7th and Foret St, next to ED White Catholic High School. From Canal St, turn Right (if coming from Houma or Morgan City) or Left (if coming from Vacherie or Hwy 1 ) on East 7th St. Drive 11 blocks, then turn left to Foret St. The Hearing Clinic will be the second building to your right.